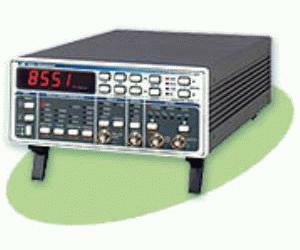 Model 8551 is a pulse/function generator, which has performance characteristics similar to the Model 8550. In addition, this instrument offers pulse and ramp waveforms as well as their complements. Model 8551 also provides an accurate control over pulse parameters and pulse transition times. The variable rise and fall times may be independently adjusted within common ranges. Linear and logarithmic sweep functions are not available on this model. Output waveforms may be gated, triggered, or may generate a burst of pre-selected number of cycles. The generator also provides a number of externally controlled modes, including VCO, FM, AM, and PLL.